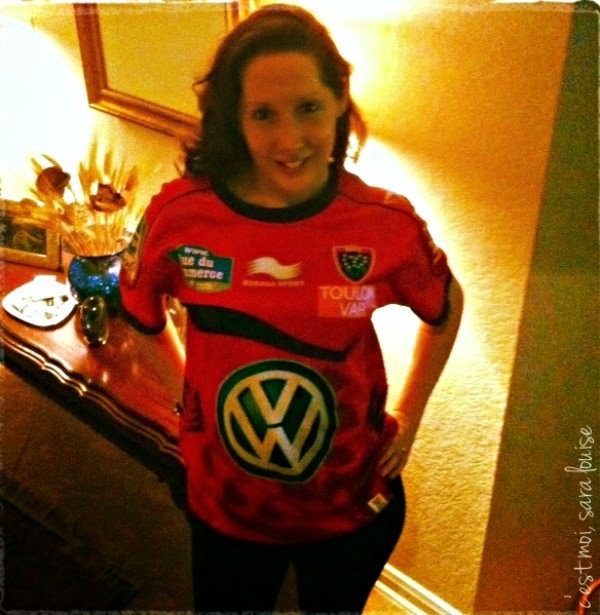 On that happy day (last Saturday the 24th), I donned my Toulon rugby jersey. Normally, I don't wear sports jerseys, but this was a special day... Mr. London was competing in his second Heineken Cup Final and since I couldn't be there like last year, I wanted to lend my support, even if I was 4900 miles away. I had found a bar out in the sticks that would show the match for us. They ordered the channel and gave us our own little cabin to watch it in (which I was informed is in the process of being turned into a wine bar/room/cabin/whatever... obviously I'll be back) and my friend, Amy, and her South African husband joined us. 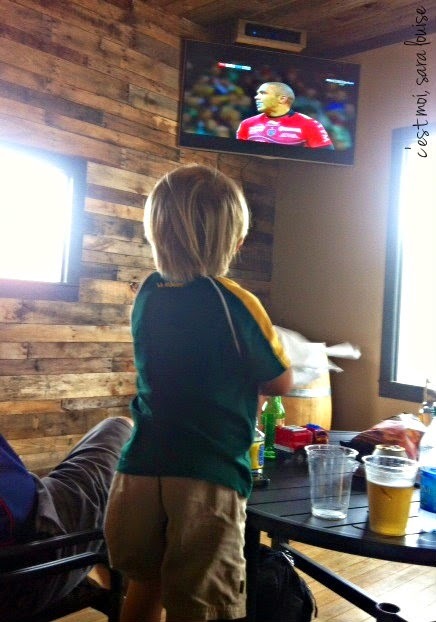 Since half of the Toulon team happens to be South African, and South Africans happen to like rugby, I thought he'd like to watch. 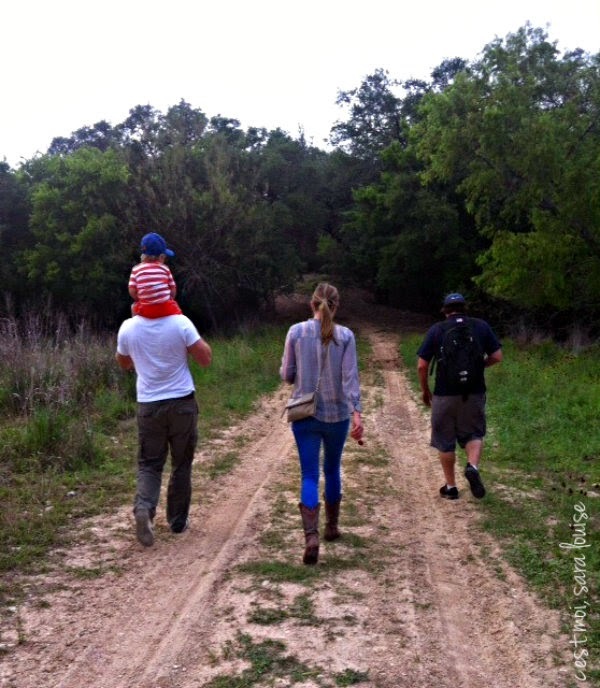 Of course he did, and he even brought their son, who came in a mini Springbok t-shirt (a rugby t-shirt, shorts, and cowboy boots is a freaking adorable look). We settled in, ordered some beers and cheered on Mr. London. He must have heard us, because they won. And then if that was a happy enough occasion, he was named Man of the Match. I thought Gregory was going to break down and cry right there, it was the sweetest thing, but he held himself together and we carried on with our happy day moving on to The Farm. 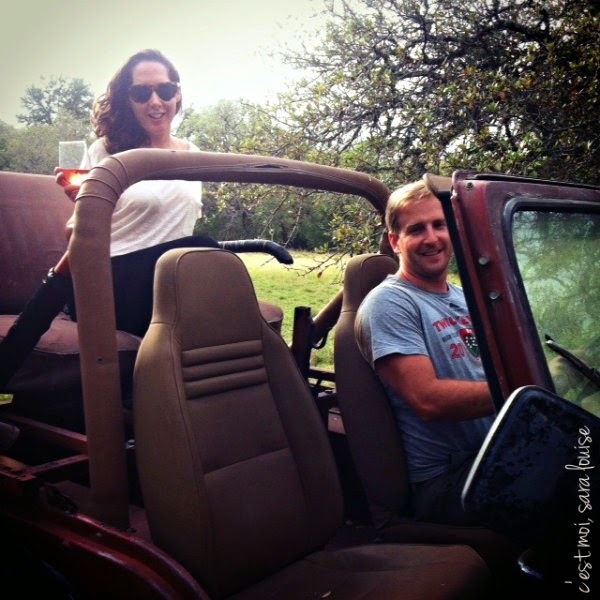 The Farm is Amy's family's place; acres upon acres of Texas Hill Country treasure, hidden deep in the outskirts of our town. It's where we've always gone to escape, recharge, get into trouble... it's magic, one of those places where you can just breathe. 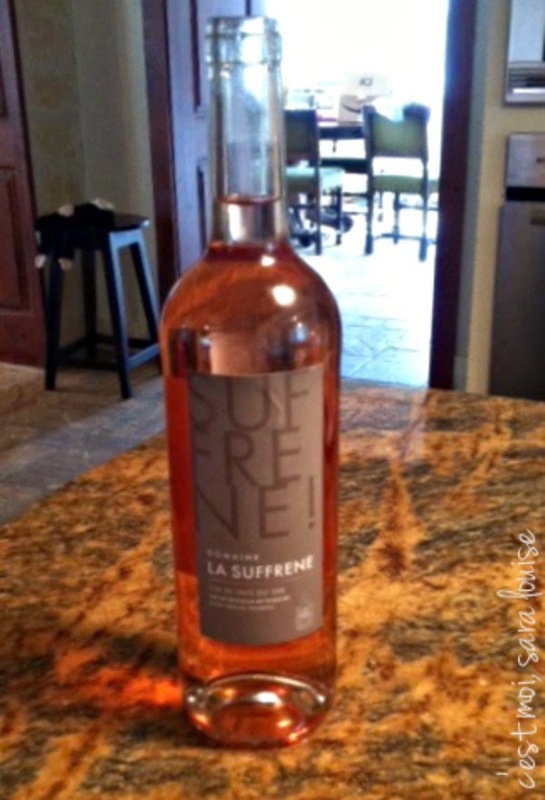 In anticipation of Mr. London's victory, I had bought a bottle of Rosé from the Var, right around Toulon way (sipping it made me feel closer to Mrs. London). So now I had three things to be happy about; Mr. London kicking Saracen booty resulting in Gregory being as chipper as a unicorn riding a rainbow, I was at The Farm, AND I was sipping delicious Rosé. BAM-BAM-BOOM. (Just typing this trifecta of delight gives me the feel goods). Because sipping Rosé and hanging out with longhorns can work up quite the appetite, we set off back to the bar where we had watched the match because they had food trucks... FOOD TRUCKS. Sure Le Petit Village has a pizza truck, but it doesn't have trucks, as in more than one, and they certainly don't have a Tex-Mex food truck which is the one I moseyed up to (three months back in Texas and I still can't get enough tacos). Fueled by bottle upon bottle of Rosé, the happy good times at the happy farm just kept on coming (including a canoe ride that made me feel just like Huckleberry Finn), and I was having so much fun being happy, that I stayed up until 3AM because clearly, I think I'm some kind of young whippersnapper. NEWSFLASH: I'm not. I love me some rugby! I'm more partial to league than union, but I'm very supportive of rugby lovers whatever the code! That really is a handsome fellow! Congrats to Mr. London, I am happy they won. Gregory must have been so proud! Nous serons samedi prochain au Stade de France à Paris pour soutenir Toulon et dire aurevoir a Sir Wilkinson......Je suis sûre que Grégory est déjà jaloux !!!! What a fun day you had. Man of the Match was a bonus too! The Farm really does look like a relaxing place to unwind. Days like this will help you to get settled in to your new adventure. Very happy for you,mGregory, and Mr. London! Wow, that farm looks fab! 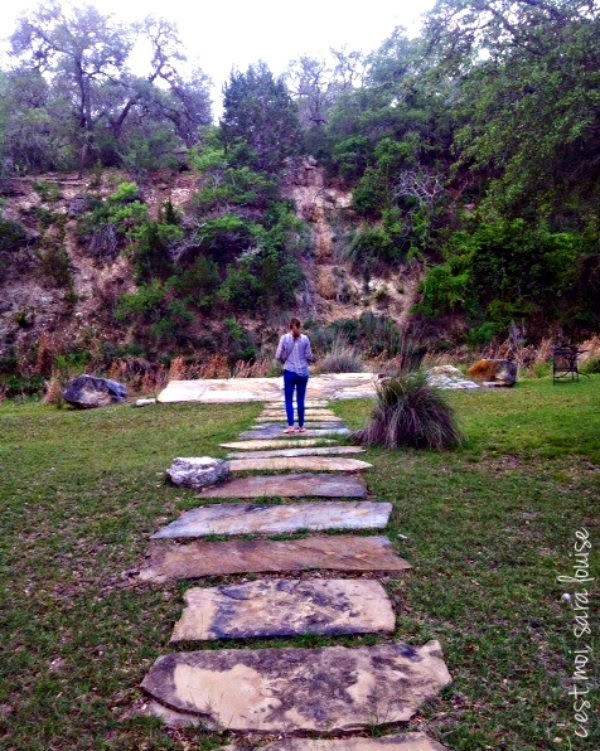 You're in the Texas Hill Country?? I'm in Austin! What a small world eh? 3 am!?! i don't remember the last time i stayed up that late, since i am also not a young whippersnapper. Sounds a great day & although I am happy for Mr London - I cannot really join in the general rejoicing on the outcome of the match being a Brit/Londoner - obviously I was rooting for Saracens & really with a name like Mr London - he is in the wrong team n'est pas? 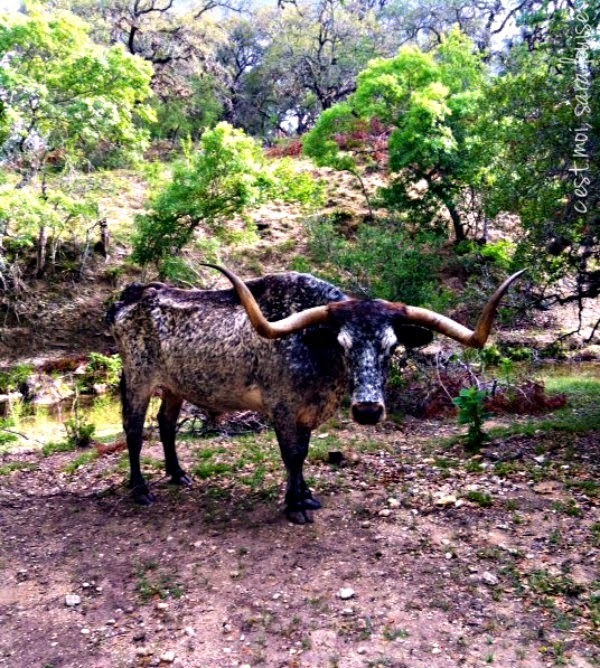 LOve the picture of the longhorn.